COMING TO A THEATER NEAR YOU…An old fear reawakens just in time for the 4th of July weekend. As much as I love the fact that I can watch Jaws in the comfort of home on a stellar transfer whenever I want it will never compare to watching it on a big screen so I’m excited about the special 40th anniversary screenings planned for June 21 and 24. Presented by Turner Classic Movies, Fathom Events and Universal Pictures Home Entertainment Bruce and Brody live to battle in theaters across the country once again for two days only. DO NOT MISS THIS! Ticket information is available here. And now…thoughts on Jaws and the bluray…with spoilers! Amity Island had everything. Clear skies. Gentle surf. Warm water. People flocked there every summer. It was the perfect feeding ground. If you don’t have time for a lengthy write-up on a 40-year-old movie then stop at OH, MY! That’s wht I think about the Jaws bluray. Fantastic in all its terrifying gloriousness. Er…I’m not sure that makes sense but neither do I each and every time I finish watching Steven Spielberg’s 1975 classic about a shark that terrorizes a small island community, which celebrates its 40th anniversary this week. The first time I saw it I didn’t sleep for a week. I have an honest-to-goodness fear of water, you see, so why I’ve watched Jaws countless times is beyond me. See, I’m nervous even commenting on it. Back to the bluray – it looks great and the sound is a WOW. I love many Spielberg films – E.T. : The Extra Terrestrial, the Indiana Jones series, Jurassic Park and others. But, in an admittedly weird sense, I haven’t the affection for those that I have for Jaws and the palpitations and hypertension it causes me. I can’t even say if it’s due to the fact that it’s a brilliant film or because the fear it represents is primal, visceral. Whatever the reasons, its impact never diminishes and it is endlessly entertaining. Peaceful, undisturbed, vastness – and my heart begins to pound. The POV switches, from below. The terror approaches. And the first tug. Downward. A gurgling sound muffles what would soon be blood curdling screams. Until there’s peace again…for the time being…a false peace. A terrible peace. Well, a hand for the little lady (pun intended). Anyway, (cough), it’s quite a scene but not the only one worthy of mention or the one most people discuss most often. There’s the “you’re gonna need a bigger boat” line that’s now a part of our vernacular, plus the poignant scene where the mother of the boy who is killed by the shark approaches Chief Brody (Roy Scheider) and slaps him. Her grief is palpable as she blames him for her child’s death, a result of his failure to close the beaches following the girl’s death. Then there’s my favorite scene, the one on the Orca (boat) where Quinn (Robert Shaw), Hooper (Richard Dreyfuss) and Brody who set out to capture the man-eating shark compare notes on their scars. Quinn, the man with the most scars both figuratively and literally, renders the other two speechless as he tells the mother of all shark stories, brought forth by the scar left behind by a removed tattoo of the USS Indianapolis. The Indianapolis was the WWII boat he was on whose secret mission was to deliver the Hiroshima Bomb. It was so secret a mission that no distress call was sent when the boat was hit by a Japanese submarine and rendered helpless. The boat sank and the waters turned into a blood pool, the results of hundreds of men eaten by sharks. The USS Indianapolis story chills one to the bone. Each and every single time you watch this. No disrespect to Shaw whose performance in Jaws is terrific, but I always think of this particular scene as an example of the absolute best of cinema as the result of lightning in a bottle. How can this be planned and executed so brilliantly on paper? My goodness! It’s pure genius to add that scene to the script and Shaw’s matter-of-fact delivery is inspired. The quiet that ensues, the residual shock of the true Indianapolis happenings always leave me with jaws agape – then a visitor comes-a-callin’. I’ll add also that I love the convergence of the three men – so different – on that small boat trying to survive not only against unGodly odds but against each other. Quinn the expert seaman who brings a hell of a personal vendetta onto the boat is hired to catch the man-killer. Hooper the intellectual, man of means who brings book knowledge to the table but who’s there mostly as a curiosity. And Brody, the nerdy and fearful lawman who restores order but is completely out of his element and becomes the unlikeliest of heroes. It’s the stuff that makes great cinema. Two last things to mention. First, proof of how much Jaws was improved by the fact Steven Spielberg and the crew could not get the shark to work properly. Two scenes I love that result in high tension due to no sight of Bruce – the scene where the two old gentlemen try to catch the shark from a pier. No need to go into the scene’s specifics. Suffice it to say the pier is destroyed. But the shot of one old man swimming for his life, back toward the destroyed pier and the yells of his friend telling him “don’t look back, just swim” as we see a large chunk of the pier make a turn and start after him is…well, pretty spectacular. The other instances are all those scenes where we see the yellow buoys/tanks popping up out of the ocean depth marking the spot where the massive shark lurks. All of those scenes may have resulted because of problems but they turn out to be highly effective. Finally, I have to give an enthusiastic shout out to John Williams’ music. Putting it simply, Jaws would not be the film it is without it. I am in no way an expert on film scores and wouldn’t be able to tell a good one from a bad one. I only know what I enjoy from a fan’s perspective, what moves me. As such, I generally judge a score by how much it ties into images of the film in my mind. In other words, as I listen to a film’s music, if it evokes images of the film that’s a wonderful score. By that standard there are very few scores better than Jaws. I can name the tune in two notes – tum-tum. Brilliant simplicity of the emotional kind. But that famous two-beat warning of doom is not the only great music in this film. The score is great in its entirety. I remember one of my film professors complaining once about the use of music in Spielberg films, saying it was excessive. I’ve never noticed excess, but certainly do not think it’s the case in this film. I particularly enjoy the music in the scene when the three men, in the middle of the ocean have shot four buoys into the shark and begin their pursuit. At that point they are sure that the animal cannot be down for long with that kind of weight on it. Then suddenly, prey becomes predator as the men realize not only is the shark able to handle four tanks, but it is now in pursuit of them. The musical transition used in the scene matches the visuals/story to perfection – from triumphant success to realization of impending doom. Beautifully done. That’s gotta be one of the best trailers ever. FANTASTIC! If you’re unsure about upgrading to the Jaws bluray, here are a few more reasons why it’s worth your time and money: aside from the detailed ‘making-of’ documentary mentioned above, there are several others that are very entertaining and informative, “The Impact and Legacy of Jaws,” which explains what we all know by now, which is that the film had a huge impact and its legacy is still alive. But it’s still fun to see footage of the mid-1970s when the film was released. There’s also a lot of cool information and footage of the massive Jaws marketing campaign. Jaws was the first true “blockbuster” that changed the movie marketing business forever. In fact, it changed the way we watch films. It was a pop culture phenomenon that actually changed people’s behavior – they really did stop going into the water and I’d say the film and its images still appear in people’s minds should you be in the water and something brushes by your leg. It’s powerful. Anyway, other features include details about the film’s restoration as part of Universal’s Centennial celebration, archival footage, trailers, many interviews and more, things that make a movie fan’s jaw drop. This is a great release by Universal. 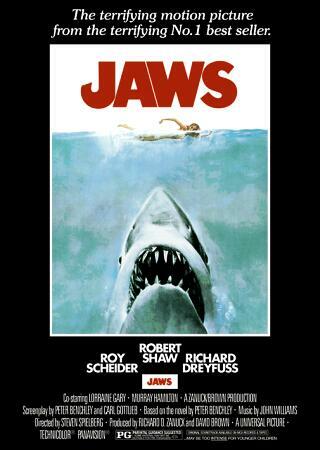 If you’ve never seen Jaws then I hope you’re not reading this as I’ve spoiled much of the movie for you. Still go to the movies on June 21st or 24th to see it as intended, on a big screen. After that get the bluray and watch it over and over. This is a film well worth your time that should be on everyone’s must see lists. Period. Farewell and adieu to you, Spanish Ladies, Farewell and adieu to you, ladies of Spain. The Jaws bluray entry was originally published on Citizen Screenings, which has now moved into the hands of fellow movie enthusiast Rob Medaska. The greatest film of the last half century. I get to go this Sunday and see it in Westwood Vs. Then the next week I’m going to all three TCM fathom screenings in my area. I’ll be adding a post to my site each screening. You have inspired me to rewatch”The Shark is Still Working”. Nice job Aurora. Thanks, Richard! I LOVE this movie, but with my very real fear of water I don’t think I’d survive so many consecutive big-screen viewings. It truly is one of the all-time greats. HAVE FUN and I look forward to your commentary! Fine tribute Aurora. Can’t say much as Richard nailed it with his comment. Kudos to you both. Same goes for me, Vern! We’re gluttons for punishment!